Aboriginal artist, Deborah Bonar has been a member of the Colour Society of Australia since 2009. She has conducted various presentations on Aboriginal art and culture, including speaking about her own art practice. 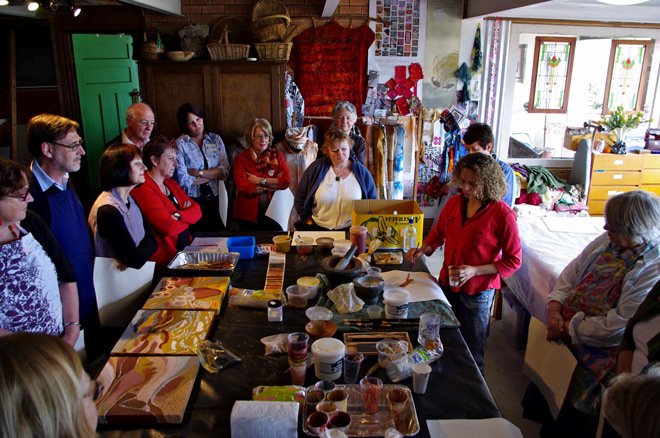 As well as conducting presentations, Deborah Bonar has conducted a series of art workshops for Colour Society members. Deborah Bonar conducted the following presentation to the Colour Society of Australia, National Conference: Space, Time & Colour. Perth 2014 National Conference. Scribblebark: Aboriginal Art Practice in the 21st Century, 4 October 2014. My Presentation initially focused on the complexity of contemporary Aboriginal art practice in relation to new technologies and the possibilities they offer, particularly with major public art projects. I then spoke of my interest in facilitating community canvases, where members of the public, or schoolchildren, are invited to contribute to vibrant dot paintings. I concluded with some images from a new body of work I have created for my upcoming exhibition and an exciting new fashion project featuring designs inspired by my connection to country. She conducted the following workshop for the Colour Society of Australia, WA Division. Colours from the Kimberley: an introduction to painting with ochres, 9 October 2011. 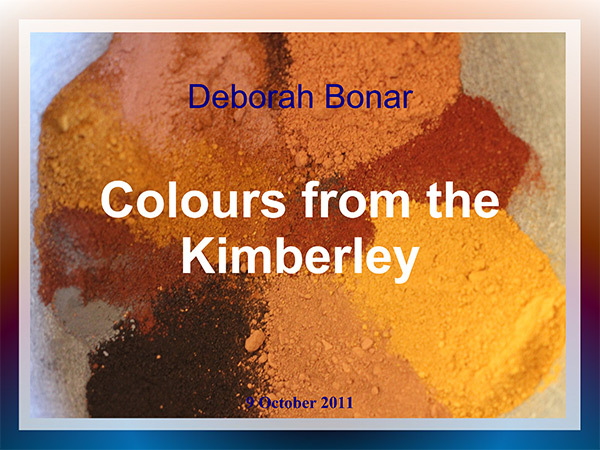 Deborah Bonar conducted the following presentation for the Colour Society of Australia, WA Division members. 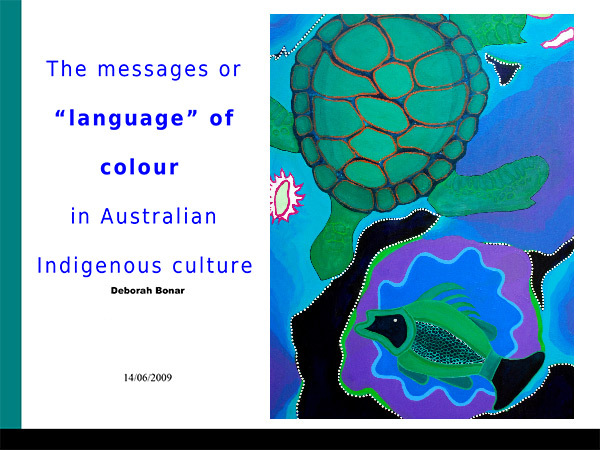 The messages or "language" of colour in Australian Indigenous culture, 14 June 2009. In my Powerpoint presentation to the Colour Society, I talked briefly about Aboriginal culture. Then I spoke about the general aspects of Aboriginal art and the use of colour to convey messages. I also showed some specific examples of particular West Australian Aboriginal artist artwork. I talked about my own Aboriginal heritage and how I use colour to convey messages in my own artwork.